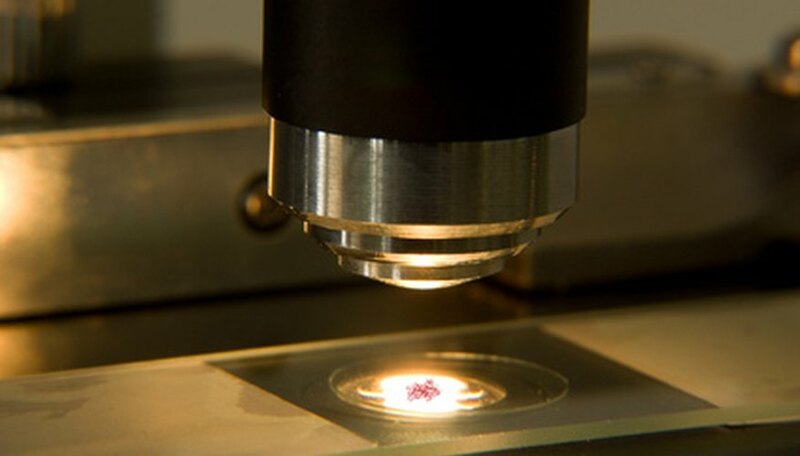 Compound microscopes use a series of mirrors and lenses to magnify specimens placed between a light source and the objective lens. Magnification and working distance are two different characteristics of a microscope that are directly related. Magnification is defined as a "function of making an object appear bigger." The magnification of a lens indicates how many times larger it renders what is viewed through it. Working distance is a linear measurement of the distance between the tip of the objective lens and the specimen. In most compound microscopes, working distance varies by lens; however, certain microscopes have fixed working distances across their magnifications. While working distance and magnification are not measures of the same thing, they are related. In most compound microscopes, as magnification increases, working distance decreases dramatically. It is important to be aware of this, as changing magnifications without being mindful of the change in working distance can damage the lenses. Goldstein, Mike. "Difference Between Working Distance & Magnification." Sciencing, https://sciencing.com/difference-between-working-distance-magnification-7203011.html. 24 April 2017.